ENO Hammock (Eagles Nest Outfitters) was founded by brothers Peter and Paul Pinholster in the Blue Ridge Mountains of North Carolina. The company produces a full range of super-light, ultra-strong portable nylon hammocks that are a great choice for those who enjoy camping out under the stars. Available at very reasonable prices - especially considering their acclaimed strength and reliability - the seriously low weight of ENO's hammocks gives lovers of the great outdoors the opportunity to leave behind the hassle and discomfort of tents once and for all. ENO's are cocoon-style hammocks, meaning they do not feature or work with 'spreader bars', which allow you lie completely flat. The emphasis instead is on keeping weight to a minimum. However that doesn't mean an ENO hammock isn't comfortable to lie and sleep in. Eagles Nest is also an accessories innovator. The company invented the 'SlapStrap', a tree-friendly fabric component that makes hanging your bed from a tree or other immovable object a 2-minute process (see below), without damaging the tree's bark or requiring you to tie complicated knots. Each ENO hammock includes a raft of identical technical features, which are key to the lightweight and durability of its products and account for their ongoing popularity. The massive strength of the company's 'parachute' nylon means ENO can make its hammocks super-thin, which vastly reduces their weight and boosts their portability. In addition to camping, ENO's products are therefore also well-suited to outdoor events such as festivals. Eagle Nest hammocks not only use highly durable material, but this nylon is stitched together in a super-strong way; another reason you can lay back with confidence. 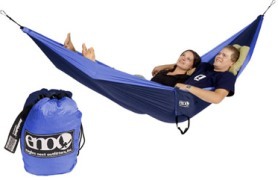 Another factor that ensures an ENO hammock doesn't break is the strength of the connected components. The rope used by ENO is sailing strength, meaning it's as strong as it gets. The last piece of the strength puzzle is the component that attaches the hammock's two end lines to either tree straps or a hammock stand. 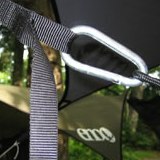 For this ENO employs a sturdy climbing-style 'carabiner' (a palm-sized metal loop with sprung gate). Below is an overview of the company's four main hammock models. Each comes with a two-year warranty but they do not include SlapStraps. The SingleNest is Eagle Nest's aptly-named single person hammock. In addition to being suitable for lightweight camping and hiking, it is also perfect for the boater, with many online reviewers saying they use their SingleNests on kayaking trips. Made from high-strength breathable nylon, the SingleNest includes its own pouch for easy packing and travel. When the hammock is hung, you can also use this to store other 'keep dry' bits such as your cell phone or book. 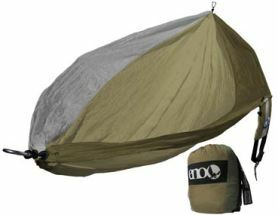 This ENO hammock measures 4' 7" (122cm) wide by 9' 10" (300cm) long and weighs just 18oz/500g. It supports up to 400lb/180kg and is available 12 two-tone color combinations. Expect to pay US $55 or less. Customer comments about the SingleNest are highly positive (we didn't find any negative feedback from users in our extensive online research). 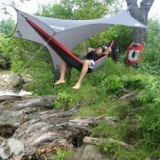 Users find this single-person hammock comfortable, easy to erect, super-durable and more than light enough to take camping (often having swapped a tent for this hammock), kayaking trips etc. Lovers of the great outdoors who regularly sleep out overnight. Tent replacers. 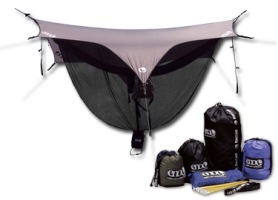 Those who do not require a full out-of-the-box hammock 'system' but just the bed itself (using their own existing accessories, such as rain tarps and bug nets, or adding these over time). This large and super-strong double hammock holds up to 3 adults (400lbs/180kg) and is the highest consumer-rated ENO hammock on Amazon. Measuring 6' 8" (203cm) wide by 9' 10" (300cm), the DoubleNest is two feet wider than its SingleNest sibling, but still packs down to the size of a grapefruit. It is available in 16 different color combinations, most of which are two-tone (the most popular on Amazon is the olive/khaki model), and weighs just 22oz (622g). Like the SingleNest, it includes its own attached pouch. Customers are very positive about this hammock, with only a couple of exceptions. The vast majority love it for the same reasons people rave about the SingleNest; comfort, strength, light weight, ease of use and total adaptability. Those who have anything negative to say usually suggest that this bed is simply quite 'cosy' for two people, and that those people who use it need to be pretty close friends! Outdoor fans such as campers, hikers, kayakers and other sailors who require a larger bed than the SingleNest - either just for more space or for sharing with a friend or loved one. As with the SingleNest above, this bed suits those who want to accessorize their bed themselves (rather than buying an all-in-one system). This high-end single person hammock is ENO's smallest and lightest hammock thanks to its being a whole nine square feet smaller than the SingleNest above and featuring a custom-designed ultralight aluminum carabiner. The ProNest measures 54"(137cm) by 96" (244cm) and weighs just 12.8oz (363g). Expect to pay US $65 or less. 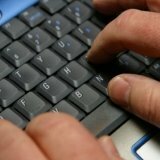 Online reviewers of the ProNest just love it. (One customer claims, interestingly, that they had finished setting-up the ProNest while their friend was still configuring the straps of their Hennessy hammock.) In our research we could not find any reviewers saying anything negative about this bed. Single sleepers who regular spend the night outdoors, particularly those who are happy to lose a little bed size in return for an even lighter product. This 'OneLink Hammock Shelter System' sounds more complex than it is. It is effectively an 'all-in-one' bundle based upon either of the hammocks above. So instead of just a hammock alone, you can configure your OneLink system as a full set: including the rain tarp of your choice, stakes (for the tarp) and the carabiners of your choice. The DoubleNest OneLink system is also available with an insect shield (bug net) option. 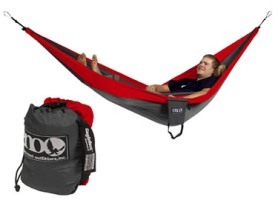 Prices vary between $199-209 depending upon the hammock chosen. OneLink users love the hammock part of this set as much as everyone else, only with the OneLink they have everything else they might possibly need too for camping out overnight. The only improvement suggestion one user made was to maybe invest in longer guylines for if camping out in sparsely vegetated areas where trees and boulders (i.e. hammock hanging points) are very few and far between. 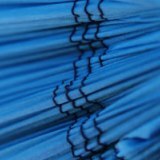 Buyers who need a super-durable and lightweight hammock bed with all the with only exceptionss included - bug net, rain cover and ENO's own SlapStraps. Presumably inspired by those few select users who reckon the DoubleNest above is a little tight for two people who are not very close friends, Eagles Nest has recently introduced the Double Deluxe - its biggest hammock to date. Available in eight color combinations, the Double Deluxe is a whole 20 inches (50cm) wider than the DoubleNest, giving couples and friends a decent amount more space in which to sleep and relax without ending up face to face. This bed weighs 29oz in total (or 822g) and has the same ENO maximum capacity as the rest: 400lbs (180kg). Because this product is very new there are virtually no real consumer reviews online at present. However, considering it is constructed the same way, and from the same materials, as the other models above, we see no reason why it should not be as high quality. Couples of campers and outdoor sleepers who want the most space possible, while still keeping things light enough to carry easily. Designed to fit snugly around a tree trunk without harming its bark, Eagles Nest's custom-designed SlapStraps take the pain out of hammock hanging. The idea is simple but effective: SlapStraps sit between a hammock's metal carabiners or equivalent connectors (each connector clips into the end of one of the straps) and the trunk of your chosen tree. No tree? Roof racks, rocks, telegraph poles etc. all work too. Just wrap a SlapStrap around the tree or pole at the height you want, pass the strap's end back through itself, pull tight and clip in the hammock's carabiner or connector. Read our full SlapStrap guide. If you are considering buying one of the ENO hammocks above, you might find this customer feedback roundup useful. Useful tips and tricks on getting the most from Eagles Nest hammocks - from comfort and safety advice to cash-saving and hanging ideas. This handy selection of ENO video reviews by end users and outdoor experts provides a good overview of the key models available. 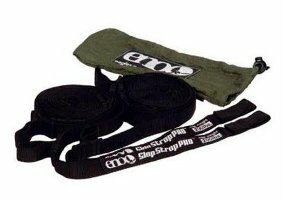 Learn how ENO's SlapStraps work and what you should consider before buying a pair yourself.